In the previous tutorial, we learned how to draw gradients in Photoshop using the Gradient Tool. 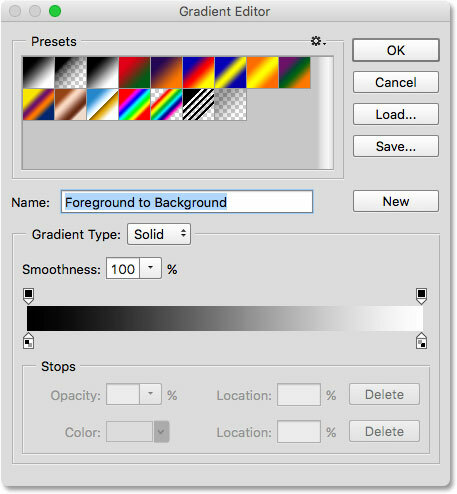 Along with how to actually draw gradients, we learned how to use the Gradient Picker to choose from Photoshop's many preset gradients. Yet no matter how many gradients Adobe includes with Photoshop, it's often more useful (and always more fun) to create your own! In this tutorial, we'll learn how to create, edit and save our own custom gradients using Photoshop's Gradient Editor. As we'll see, the Gradient Editor lets us choose from any of Photoshop's preset gradients, just like the smaller Gradient Picker, but it also lets us edit those gradients by choosing different colors, adding more colors, rearranging the colors, and removing colors! We can add transparency to the gradient, and even adjust how the colors transition from one to the other! 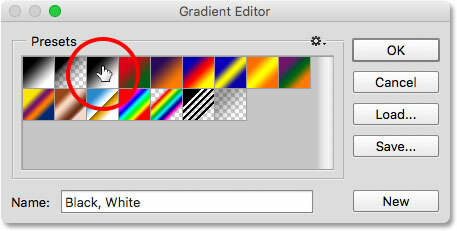 And, we can save our gradient as a custom preset so we can choose it again quickly the next time we need it! I covered the basics of drawing gradients in the previous tutorial, so here, we'll focus mainly on the Gradient Editor itself. If you're not yet familiar with Photoshop's Gradient Tool or how to draw gradients, I highly recommend reading our How To Draw Gradients tutorial before you continue. I'm using Photoshop CC but everything we're about to cover applies to Photoshop CS6 as well. Let's get started! Creating a new 1200 px by 800 px document. Clicking the gradient preview bar in the Options Bar. Using the Gradient Editor is a two-step process. We don't actually create a gradient from scratch. Instead, we first choose a preset gradient to serve as a starting point. 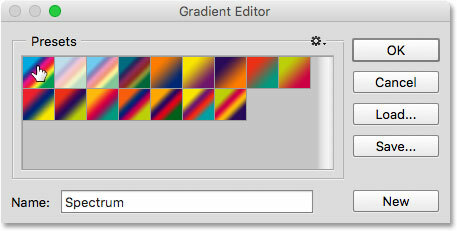 Then, we edit the preset gradient's colors to create our own custom gradient. Clicking on a thumbnail to select a preset gradient. Choosing the Color Harmonies 1 set. 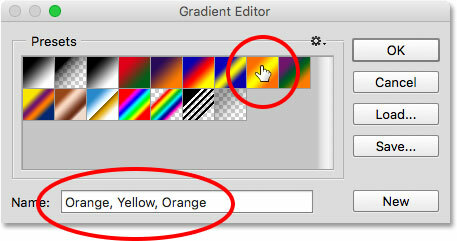 Clicking OK to replace the default gradients with the new set. The Color Harmonies 1 gradients. Clicking OK to restore the default gradients. The original gradients have been restored. If the whole point of the Gradient Editor is to create our own custom gradients, why does it give us access to so many presets when we can already choose presets from the Gradient Picker? 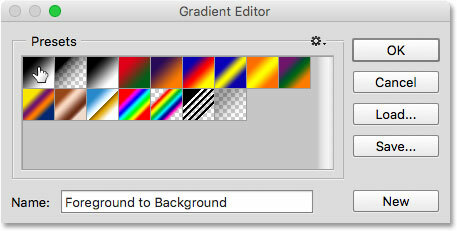 Well, as I mentioned earlier, we don't actually create gradients from scratch in Photoshop. Instead, we start with one of the preset gradients and then we edit its colors. The reason the Gradient Editor gives us access to all of Photoshop's preset gradients is so we can choose a preset that's already very similar to the gradient we want to create. That way, we'll have less work to do. For example, if we need to create a gradient that transitions between three colors, we can start by choosing a preset that already contains three colors. They may not be the colors we need, but at least it already has three of them. Likewise, if we're creating a gradient that transitions from a solid color into transparency, we can save ourselves a bit of time by starting with a preset that already transitions into transparency. Or if the gradient will be using, say, pastel colors, it may be easier to first load the Pastels gradient set and choose a preset that's already using colors similar to the ones we need. Choosing the Black, White gradient. The selected gradient appears in the preview bar. Make sure Gradient Type is set to Solid. The color stops below each end of the gradient. Click the stop for the color you want to change. Click the swatch to change the color. 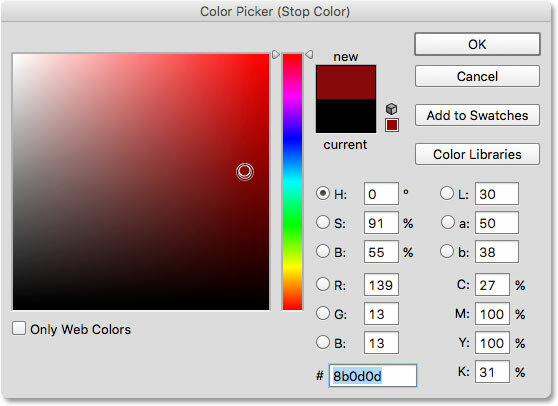 Choosing red from the Color Picker. The black in the gradient has been changed to red. Changing the white in the gradient to yellow. Adjusting the transition by dragging the midpoint icon. Manually entering a new Location value. The midpoint is now back to being halfway between the two colors. Clicking to add a third color. 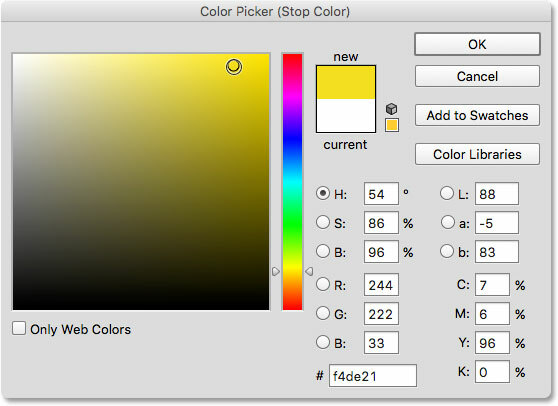 Double-clicking on the new color swatch. Choosing a third color for my gradient. The third color has been added. Moving a color by dragging its stop along the gradient. Moving a color by entering a new Location value. Dragging the blue stop to the right edge of the gradient. Selecting the blue color stop. Dragging down to remove the color stop. 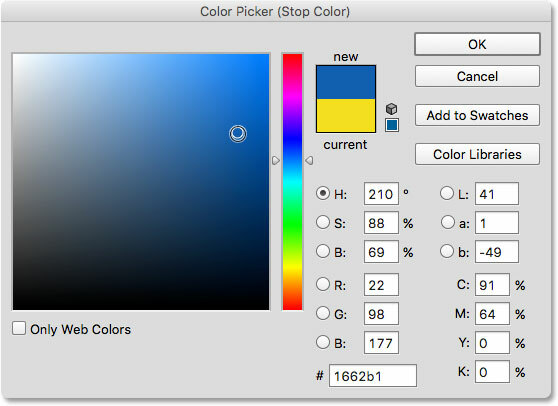 Another way to add a color to a gradient is to make a copy of an existing color. To do that, press and hold the Alt (Win) / Option (Mac) key on your keyboard as you click on a color stop and drag it left or right. Rather than moving the original stop, you'll drag out a copy of the stop that you can then position anywhere you need along the gradient. Clicking and dragging a stop while pressing Alt (Win) / Option (Mac) creates a copy of it. Copying existing stops makes it easy to add the same color to different parts of the gradient. Selecting the transparency stop on the right. To add transparency, I'll click on the arrow to the right of the current opacity value, then I'll lower the value by dragging the slider towards the left. I'll lower it all the way down to 0% to make the right side completely transparent. You can also create partial transparency by choosing a value between 0% and 100%. Lowering the Opacity value of the transparency stop on the right to 0%. Moving the transparency stop from the left to the center of the gradient. Like color stops, transparency stops can be moved by changing their Location value. Clicking to add a third transparency stop in the middle of the gradient. Each transparency stop is fully independent of the others. Adjusting the midpoint of the transparency on the right. Removing the transparency stop on the right. Dragging the transparency stop from the middle to the right of the gradient. The new gradient will appear after the others in the presets area. And there we have it! That's how to create and edit your own custom gradients and save them as presets using the Gradient Editor in Photoshop! To learn how to draw gradients with your new presets, be sure to check out our How To Draw Gradients In Photoshop tutorial! Visit our Photoshop Basics section to learn lots more about Photoshop!